Breakfast will be served at the hotel. At 6:30 a.m., we'll set off by coach for the Château de Chambord. King Francis I built this extraordinary castle as a hunting lodge. It is one of the most recognizable châteaux in the world because of its very distinctive architecture blending traditional French medieval forms with classical Renaissance structures. Enjoy a tour of this majestic castle and its grounds. We'll then continue on to Chenonceau, stopping for lunch in a local restaurant. Our afternoon will be spent visiting the Château de Chenonceau. Once of the best-known and most-visited châteaux in the Loire Valley, it spans the Cher River. Its architecture is a fascinating mix of late Gothic and early Renaissance. The list of aristocrats and nobles that have lived in it is astounding: Thomas Bohier, Diane de Poitiers, and Catherine de' Medici, to name just a few. 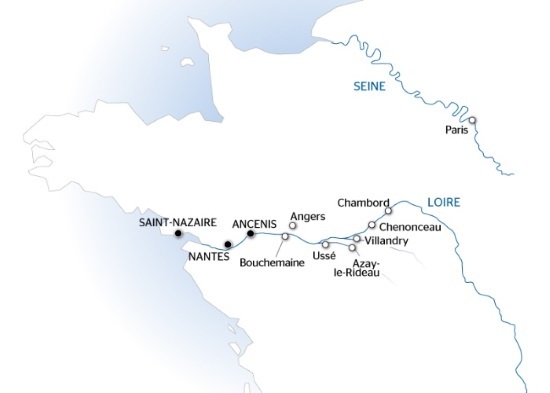 After our visit, we'll head to Nantes, arriving in the evening. We'll welcome our passengers on board upon your arrival. After comfortably settling into your cabins, we'll introduce our crew at a welcome cocktail. Excursion for both packages: A boat tour on the Erdre, one of the most beautiful rivers in France. CLASSIC : Guided tour of Angers, its historic districts and the famous Apocalypse tapestry(3). (3) Site closed on January 1st, May 1st, November 1st and 11th, and December 25th.